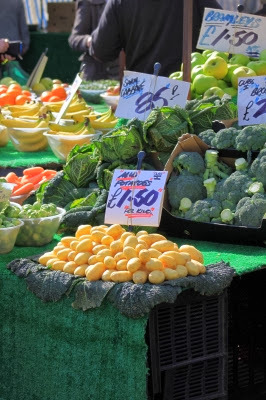 I have always tried to have a healthier eating habit by including a lot of vegetables, fish and fruits into my diet, but this year I really aspire to lead a healthier lifestyle and finally lose some unwanted pounds that is why I am really bent on eating less meat and more fresh produce. 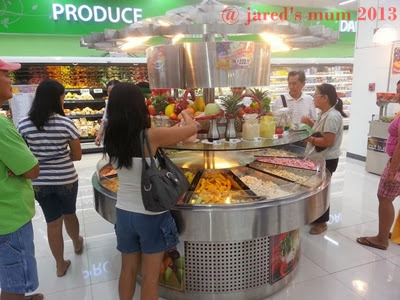 It is also the reason why I was so thrilled to find out that the recently-opened Robinsons Place Malolos actually have some sort of a salad bar in their supermarket. I was a huge fan of their fresh fruits salad at the other local branch, so I really cannot wait to give this one a try. Also, what is more exciting is that apart from the sliced fruits you can readily buy per gram depending on how much you can consume, and in recyclable containers to boot, they also added fresh salads, a bevy of toppings and a number of dips and dressings, as well as an assortment of other salads, including my instant favorite, baby potato salad. The first time I visited, I bought a big tub of it and I really liked it! This salad bar is perfect for those who want to go on a diet, or eat healthier, even when they do not know a lot of healthy dishes to prepare at home. A big tub of potato salad is perfect for dinner, when you do not want to eat anything heavy or when you are just too lazy to prepare a dish. I know I will keep coming back to this part of the mall. Consuming more salad and more greens is a surefire way for me to shed these unsightly fats. I just hope these food items will also inspire me to get up and spend time on my mat soon! This entry was posted in food musings and tagged healthy eating on 7.February.2014 by admin. Society has arrived at a place of convenience. We shop where it’s closest, and we eat what is fastest. This also leaves us with pretty unhealthy options. Following is a little more information about natural and processed foods, and basic information on how to pick the best foods for a healthier life. Just because something is “natural” doesn’t mean it’s healthy. Just to give you some idea, the U.S. Food and Drug Administration doesn’t put strict parameters around labeling food as natural. According to them, a natural food may have no added color, artificial flavors, or synthetic substances. However, does this mean something is healthy? If it has carbonated water and lots of sugar instead of aspartame, does that mean it’s good for you? Let’s put it another way: tobacco is natural. Does that mean it is healthy to chew on or inhale? No. Consider these things when you see a food labeled “all natural ingredients.” Just because it’s not artificial doesn’t mean it is good for you. One more angle to take in the natural food discussion is regarding processed food. For example, you could get something that does not have artificial flavors or colors, but it has still lost much of its nutritional value through processing. The FDA says that food can be labeled “natural” if it is minimally processed, though there’s no firm definition of that phrase. The best way to eat natural food besides growing your own food is to stay in the produce section of the grocery store and avoid foods with a label in general. Eating fruits, vegetables, and whole grains along with meats containing the least amount of preservatives possible is the best way to stay healthy. Note that in the produce section, you should look for four- or five-digit PLU codes starting with three, four, or nine so that you can eat conventionally or organically grown food. Five-digit codes starting with eight mean that the food has been genetically modified. This is all just an introduction to eating naturally and avoiding processed food, but the sooner you start, the better you’ll feel! This entry was posted in food musings and tagged food tip + tricks, healthy eating on 17.September.2013 by admin.